This drill will teach you how to hinge correctly from your hip, keeping your spine intact in the perfect position for consistent, efficient and safe rotation during the golf swing. The perfect spine angle varies, depending on your body — your build, the relative length of your arms, legs, torso, etc. — and on your golf club selection. This drill will teach you how to find the optimum spine angle for you. 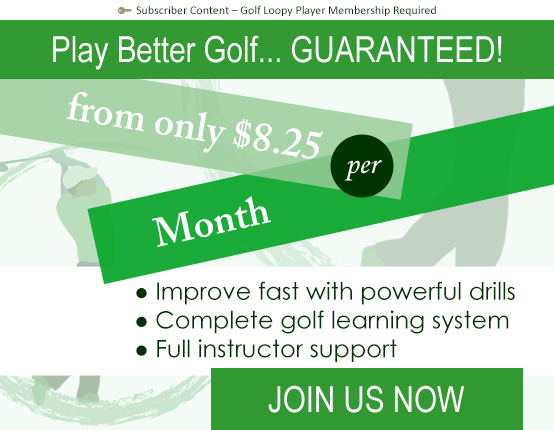 It will enable you to address the golf ball in great posture and balance. With a solid, balanced foundation for rotation you’ll be able to move more efficiently and safely, using the large muscles in your lower body and core to generate more power and stability throughout the golf swing. Your swing will become more consistent as you become more able to bear and balance the enormous centrifugal and inertial forces that are trying to pull you away from centre during the golf swing. …include your Golf Swing Drill 102 – Setup: Perfect Golf Stance Width and Ball Position checks, make sure that your stance width is correct and that your hips and shoulders remain aligned parallel to the target line as you hinge. Congratulations! You now have the perfect spine angle and balance to support a truly great golf swing! Repeat this drill as often as you can, for at least 5 minutes once a day for a month, and then regularly thereafter. Many of our students like to practise this drill whenever they find themselves in front of a mirror — in the bathroom, in a department store, anywhere — though any onlookers might think you’re a little odd! That’s great, but the full drill requires more focus than you’re likely to find in the sportswear section, so make sure you practise properly at home, too. Regularly use photos and video to check your position carefully. If it’s not correct, why not? How does it feel? Correct your position, how does that feel different? Perform the drill while using a real golf ball, occasionally, in roughly the correct position for a 6-iron. Try the drill while looking only at the ball. Check your alignment. Check your stance width. Estimate it. Feel it. Don’t neglect Golf Swing Drill 101 – Setup: Perfect Posture and Connecting to Your Core and Golf Swing Drill 102 – Setup: Perfect Golf Stance Width and Ball Position, continue to include them in this drill, they are a vital part of the foundation you are building, one drill on top of the last, for a truly great golf swing. You should be constantly reaching, performing the drill more quickly as you perfect it, then building one drill on top of the last, but if you start to make too many mistakes then slow down, if necessary step back to the drill that will fix those errors and work forward again from there. 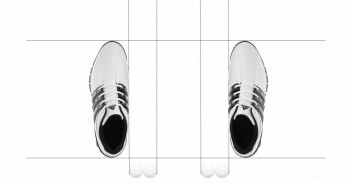 If you spot an error in your basic posture, go right back to Golf Swing Drill 101 – Setup: Perfect Posture and Connecting to Your Core, work through it until you’ve identified and corrected the source of the error, practise fixing it, then build up again slowly, one drill at a time, making sure that the error doesn’t reappear or lead to other mistakes. You’ll have to repeat this process many times, but you’re constantly building those neural pathways, increasing your skill levels, even when you don’t feel like you’re making much progress. After about a month of performing this drill, your perfect spine angle, posture and balance should be automatic, even small mistakes should “feel wrong”. Keep performing the drill daily until you get to this stage. Continue to perform this drill regularly for as long as you play golf. Small errors can easily creep in, without you noticing, unless you check regularly. If you don’t catch them quickly, these small errors can quickly spread, causing damaging compensations and manipulations throughout your swing. The best golfers in the world check their basic setup very regularly, so should you. Next up: Golf Swing 104a – Setup: The Perfect Golf Grip.